Poor reporting of the destruction of heritage threatens our ability to protect the past. This has been a rough week for the past, one in a long line of rough weeks. I’ve spent the past few days quite upset. The Mosul museum has been smashed up, a lamassu has been drilled in the face, and the Iraqi govt has said they believe Nimrud has been attacked. How have we let things slide to a point where news outlets reporting the words of other news outlets without any independent source checking is acceptable? How have we failed to teach large swathes of the public critical reading and reasoning skills? Let me preface everything that I am going to type with a few things. Despite what some rather unpleasant people on twitter have accused, criticising poor reporting about heritage destruction is NOT condoning the destruction. Quite the opposite. Requiring proof and accuracy of information allows all of us to assess the real extent of any damage for the purposes of studying the destruction events or planning responses. This is clearly important to me. Furthermore, for those who don’t study this sort of thing, accurate reporting prevents ‘us’ from giving ISIS credit for acts they didn’t commit…and cuts down on providing them with inspiration for future acts. To accuse anyone who demands accuracy and corroborated evidence of ‘siding with the enemy’ is fallacious and cowardly. Yes, this is happening…to me and to others. Also, I will update this post DOWN AT THE BOTTOM when we know something solid. Even when we do, the sentiment behind this post stands. As I type this we do not know if Hatra has been destroyed. It may have been wiped off the earth, but there is no evidence yet that the World Heritage Site of Hatra has been destroyed. No photos. No drone or satellite imagery. No named source. The Iraqi government has NOT said Hatra has been destroyed, just that it has received reports that it has, largely from the media. We do not know. That will change, for sure, but right this moment we don’t now know. I am NOT saying Hatra is intact. I am NOT saying that it has been destroyed. I AM saying that one of those two things is true. I AM saying that the current available evidence does not tell us which one is true. Not knowing has not stopped the media. The Iraq Government has NOT said Hatra has been destroyed, only that it has received reports that it has which have not been confirmed. The articles, all mostly repeats of the Reuters piece, do not say that the government said Hatra has been destroyed. It makes me wonder if the headline writers and news outlet copiers even bothered to read the piece. The problems with the article (and the repeats of it) are more sinister. It quotes a couple of unnamed sources, none of whom have any sort of official position, and offers no photos or even believable accounts. Worse, none of these news outlets appear to have done anything to confirm the information in the original Reuters piece with additional or official informants. They are just letting it play on. They are reporting news outlets’ reporting as news. This seems like a failure of Journalism 101. An exception is a New York Times piece that appeared yesterday quite a bit later than the others: Jihadists May Have Wrecked an Ancient Iraqi Site. Why is this one different? Well first, the headline matches the information available. “May”. Second, it appears to have been written independently of the Reuters piece and is filled with quotes from named official sources within Iraq who are in a position to comment about what is going on. What does the Iraq government say via Qais Hussein Rashid, the deputy minister for tourism and antiquities? That they believe that *NIMRUD* has been destroyed, that their deputies have confirmed that, but that they haven’t reviewed photos of Hatra and are really just at the ‘receiving unconfirmed reports’ stage. Another source used by the New York Times? The Ministry of Tourism and Antiquities website which, again, cites the media as the source for unconfirmed Hatra reports. However much news agencies like The Art Newspaper (Hatra ‘demolished’ by terrorist group) report that the Ministry’s website confirms the Hatra reports…it doesn’t. Look for yourself. Apparently the Art Newspaper didn’t bother. It took me two seconds to look last night and I was even a little tipsy while I did their fact checking for them. Why am I so beat up about this? Because this stuff is serious. If we get whipped up into a panic about the wrong things, we will neglect to pay attention to the right things. Reporting “we don’t know” like it is reality is a major distraction. It is how confirmed crimes and real problems are hidden. It also does ISIS’ PR for them without them, you know, actually having to do much work for it. It gives them power. I am simply not willing to do that. I’ve always been a big fan of Carl Sagan’s Baloney Detection Kit from The Demon-Haunted World. At times like these, when I see people I truly respect not approaching information with reasonable skepticism, I want to just discreetly email them the ‘kit’ and hope they sort themselves out. I sit here and panic that I haven’t taught it in my antiquities trafficking class yet. I’m thinking it will be part of our final session in a few weeks. I always think these things are obvious and intuitive, but I have to remind myself that they are not. People need the kit. Basically the kit gives one a way to evaluate believability. You don’t use it to determine if something is true or false, for the most part, but rather whether you should accept something as fact based on the evidence at hand or demand more or better evidence. Mostly it is meant to evaluate arguments, but if we consider news reporting as an argument for a specific set of facts, we can use it here. I don’t want to pick apart the Hatra reporting using the kit here (although I invite you to do so if you need to), rather I want to offer it to anyone out there who is having trouble with the tsunami of sloppy ‘reporting’ that we are all being hit with. I say, again, that we will soon find out what is up with Hatra. We will get independent confirmation that it is either destroyed or intact. We will see photos. We will eventually know. It might really be horrible and devastating. But right now we don’t know. I wish we did, but we don’t. 1. The poor reporting continues into 8 March as allegations start to fly that the site of Khorsabad is being attacked. For example a headline that reads Isis launches assault on third archaeological site in three days in bid to destroy centuries of human knowledge (Independent) sits atop an article that says that the Iraqi government “has received reports” that Khorsabad is being either looted or damaged and their cited source is the Associated Press citing a ‘Kurdish official’ named ‘Mamuzini’, seemingly either truncating their copy and pasting or letting it slide that dude only has one name. Basically this is indicative of nearly all reporting at the moment. I am NOT saying Khorsabad is safe, I am saying we don’t know. 2. Reuters is reporting that Qais Rasheed, chairman of the State Board of Antiquities and Heritage , has said “We have confirmation that they bulldozed sites at Nimrud and Hatra. What we don’t have is information about the size of the area which has been razed.” Since I currently don’t trust Reuters as far as I can throw them, I would like to see that statement somewhere else, but it seems at least reasonable and from a reasonable source. Scale is the issue. Rasheed says nothing about Khorsabad. 3. Apparently Rasheed called attention to the Mosul situation today in a speech made during a ceremony to inaugurate a management plan for Babylon. 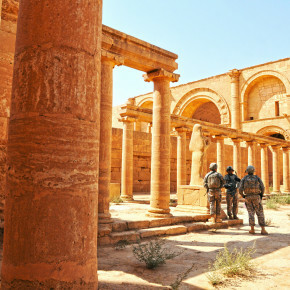 Note that the Ministry of Tourism and Antiquities site, which reported the ceremony, does not say he confirmed the reports about Hatra, Khorsabad, or anywhere. I haven’t seen a recording of the speech and I wouldn’t understand it if I had. 4. Now, nearly a month on (3 April 2015) a video of destruction at Hatra has been posted (thanks to Sam Hardy for letting everyone know). As expected, the video shows destruction, but pickaxe/sledgehammer destruction targeted at statues. No bulldozers. Yes this is horrible, but this is not what the sloppy media reported. Hatra has NOT been bulldozed and the media continues not to fact check what they publish about this. 5. Again, a month on (11 April 2015) a video of the destruction of Nimrud has emerged. Again, no bulldozing of the city, although some machinery is used to move some smashed objects. Rather ISIS is shown blowing up the site and the above-ground features appear to be gone. It is unclear when the video footage was shot: before or after this media mess.